Shirakawa-go (白川郷) is the village of traditional houses in the Gassho style. Shirakawa-go is the UNESCO world heritage site, registered in 1995. It is located Hida area of Gifu Prefecture. Gassho style house is the traditional Japanese houses which is mostly built in northern Japan because it's designed for a heavy snow. Gassho style are characterized by a large, steep thatch roof. The roof resembles hands folded in prayer, thus the name "Gassho" (to pray) style. Shirakawa-go has many original Gassho style houses, and all of them are still used as the house. 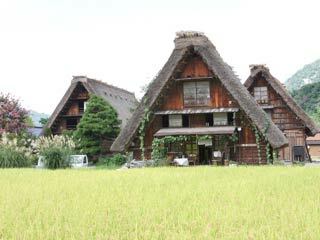 There are 113 Gassho Style houses in Shirakawa-go. There are some Gassho style houses which open for tourists. The entire area is highly restrict with fire. Smoke at only designated area. Shirakawa-mura Ogimachi Important Preservation Districts for Group of Historic Buildings. UNESCO World Heritage: The Historic VIllage of Shirakawa-go and Gokayama Traditional Houses in the Gassho Style. People start living Shirakawa-go in the late Jomon Period (8,000 B.C.E. to 200 B.C.E). Before 16th century, there were about 50 houses in Ogamimach (official name of Shirakawa-go) area. By the end of Edo Period, the number of houese had increased to 80, and by mid Meiji there were over 100 houses in the area due to the development of sericulture. Shirakawa-go is a typical Japanese farming village, dotted with houses, rice field, and gardens that are connected by narrow roads and a network of watercourses. The village spreads north to south along the Shokawa River. The arrangement of the houses mirrors the courses of the river. All but two of the gassho style houeses stand with the gables facing north and south. THe wooden storehouse are "hasagaya" (drying house for rice plants) stand apart from the main houses to prevent fires from spreading should one ignite. Originally, buildings in Shirakawa-go were located far from each other to prevent the spread of forest fire, but now many modern buildings are clustered together along the old national highway that cuts through the middle of the village. There are three reasons why the roof surfaces of the gassho style face east and west. First, constant sunshine is essential to the durability of the thatched roofs. The eastern and western sides of the roof can catch the maximum amount of sunshine available in the narrow mountain valley. Second, strong winds frequently blow north and south along the river, particularly in the typhoon season, so the large roof of the gassho style need to face east and west so that they don't receive the direct force of the wind. Shirakawa-go usually has heavy snow from December to March. The snow easily get over 2 meters tall. On Saturday evenings in January and February, Shirakawa-go has the light-up to showcase the Gassho Style and winter landscape. Wada House is one of the largest Gassho Style Houses in Shirakawa-go. It was built in early Edo Period, and chosen as the important historical asset of Japan. Wada House was designed as the high class houses, and it shows the traditional architecture of Edo Period. Admission: 300 yen for Adult, 150 for kids.